Let me start by apologizing for the delay in getting this post out there. Quite unbelievably, not just one, but TWO (!) 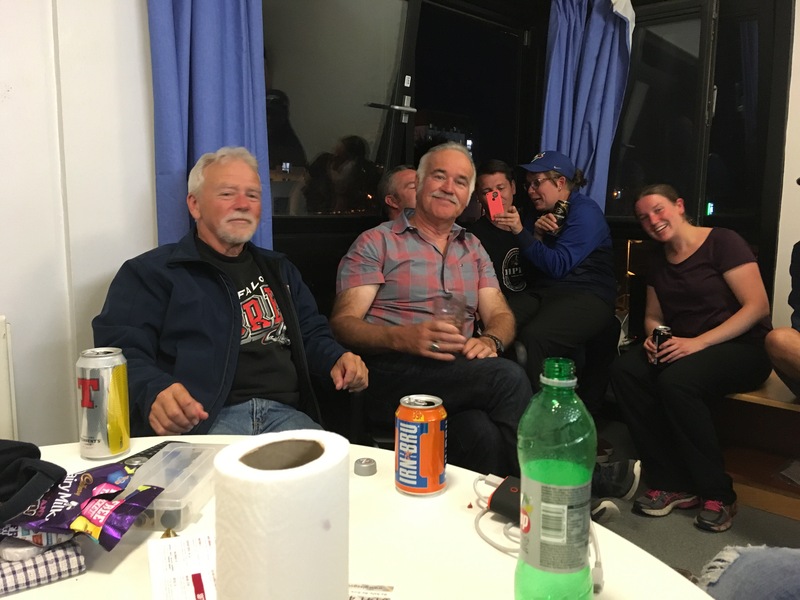 people have requested a post about my trip to Glasgow for the World Pipe Band Championships 2017. How crazy is that? Okay, one request was from an immediate family member, but the other wasn’t. Honest! And a brief explanation of the one-and-a-half thing. 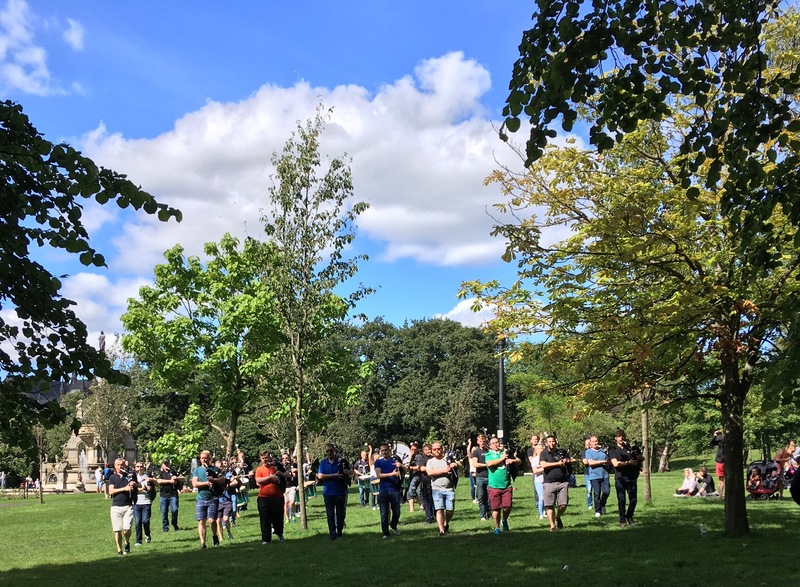 I have a few stories about events which took place earlier in the summer, but I’ll share them in a few weeks’ time. 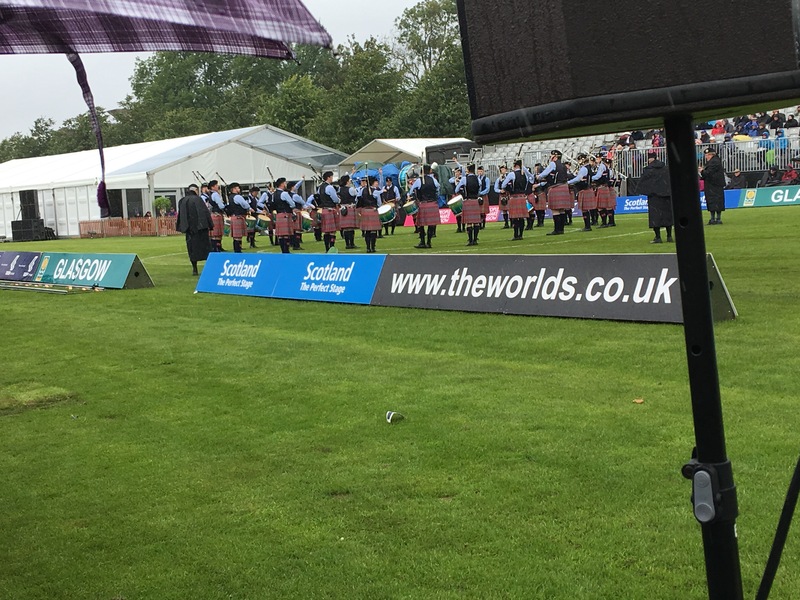 This post deals exclusively with the World Pipe Band Championships, but it’s out of sequence, from a strictly chronological point of view. I figured if I called it Part 2, some readers might think that I had made an error, or that they had missed Part 1. Therefore, since Part 1 hasn’t been written yet, and I didn’t want to call this Part 2, then Part 1 1/2 seemed to be the answer. Well, at least the best answer that I’ve been able to come up with. Bear with me. 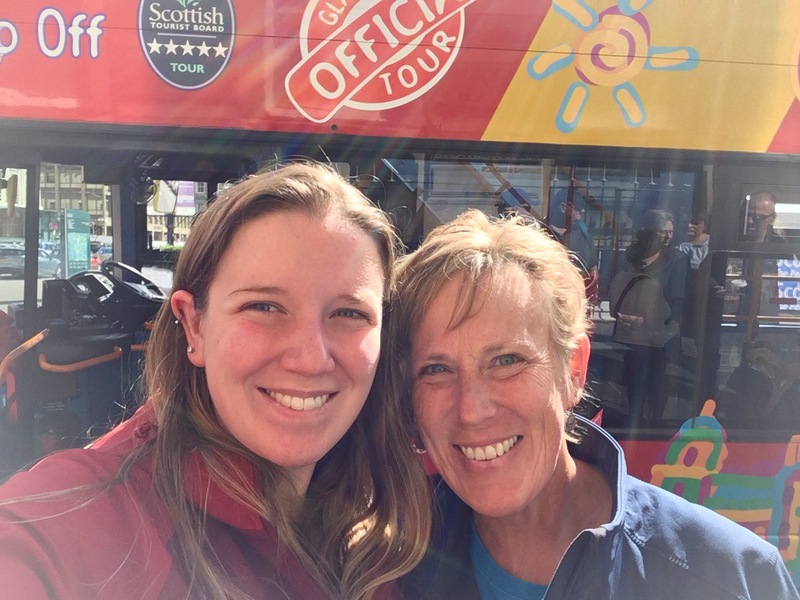 This year’s trip to the Worlds was very different from the last four, two of which were documented here on my blog. 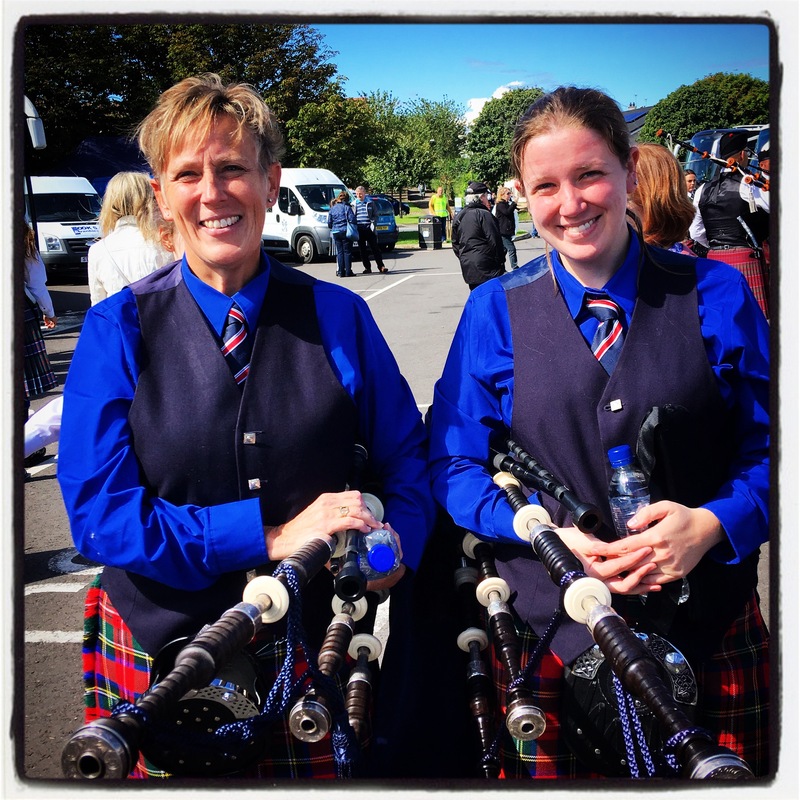 The big differences were twofold – first, Robyn travelled with me this year, and second, we both played with a grade 3 band – the Hamilton Police Pipe Band. 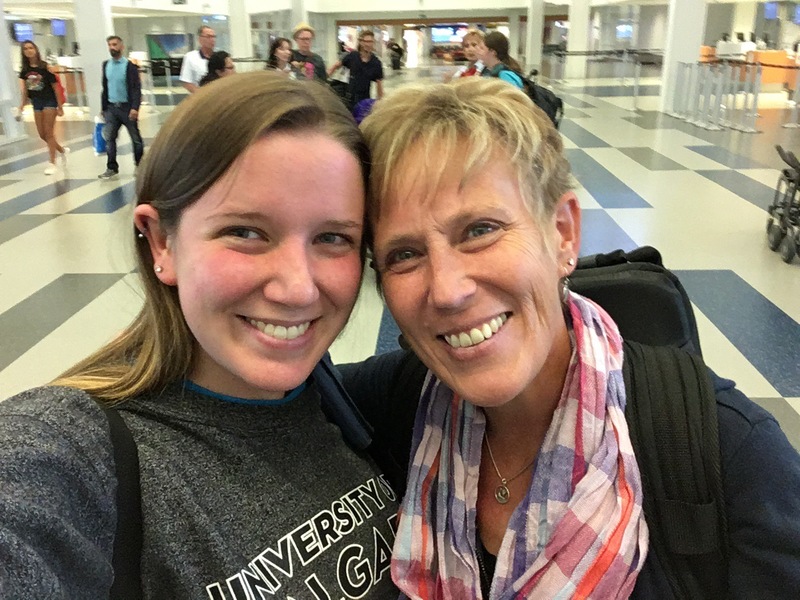 The former difference quite simply meant a lot more fun for me, as I always enjoy my time with Robyn no matter where we are or what we’re doing. We always manage to have a good laugh. 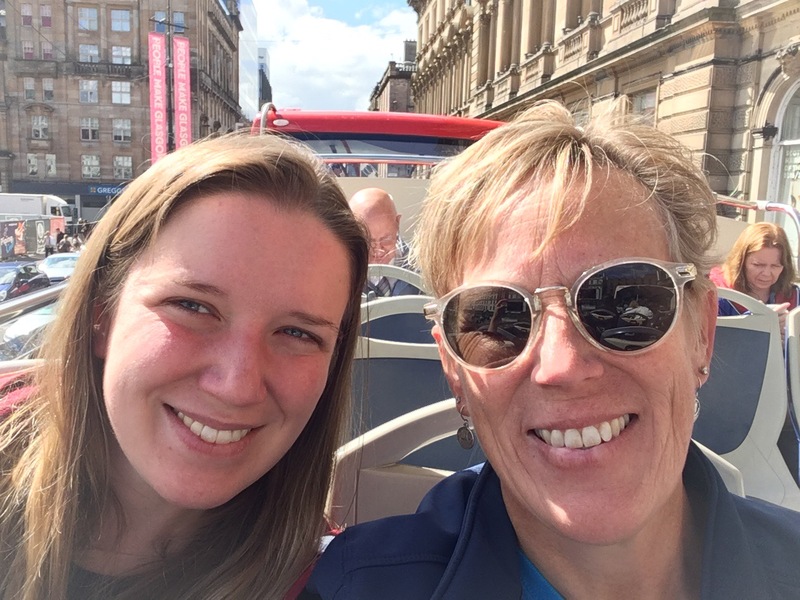 The latter difference meant that the preparation during “Worlds week”, leading up to the championships, was much less intense, resulting in quite a bit more free time to treat the trip as a holiday. Plus, we actually got to play on the day of the World Championships this year, on the Saturday, rather than playing in the grade 1 qualifier on Friday. But I’m getting ahead of myself! I should document the trip from the beginning. 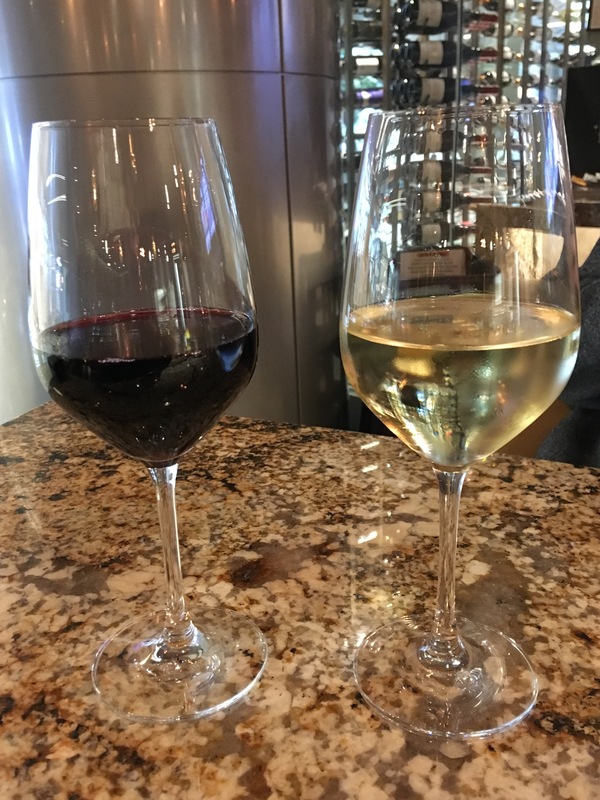 As with the trips to Scotland in 2015 and 2016, I started off with a glass of wine at the Calgary airport. There’s a new terminal at the Calgary airport now – actually, it opened in the fall of last year – so the location of my glass of wine changed, and also I had company! 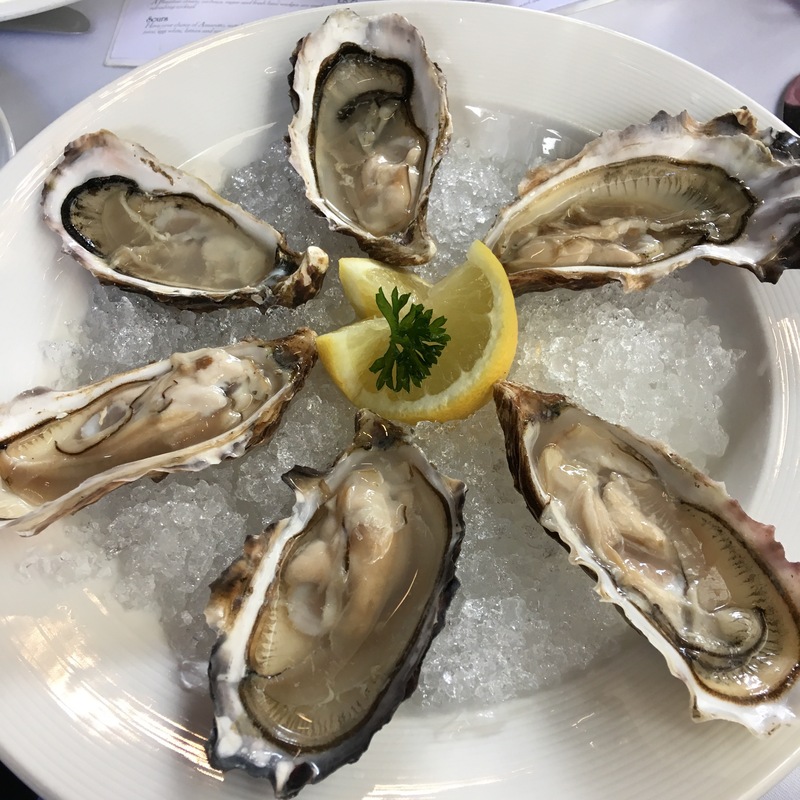 We flew from Calgary to London’s Heathrow Airport, and had quite a lengthy layover there. 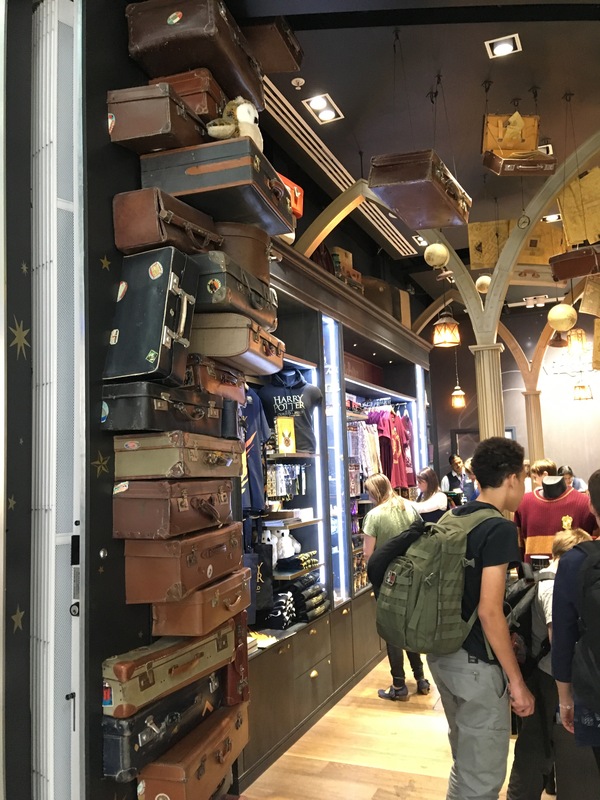 It turned out to be a good thing, because it sure takes a long time to get between terminals, through border control and then through security in that airport. I’m pretty sure we had to dash into the next county at one point on our way to the next Terminal. 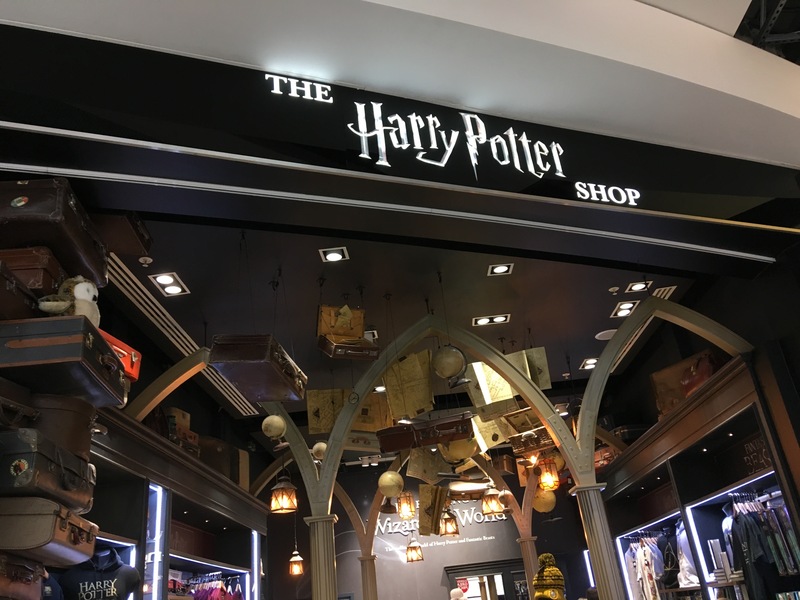 However, it’s a nice airport with lots of interesting restaurants and shops. 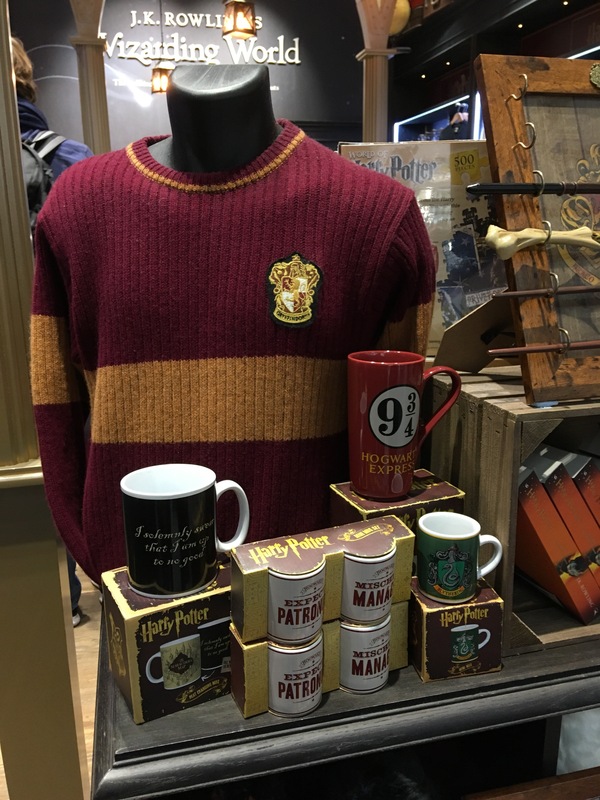 We spotted a Harry Potter shop, this being the 20th anniversary of the release of the first Harry Potter book. No, the stack of cases along the left wall in the centre photo above aren’t old bagpipe cases. Well, I suppose they could be, but somehow I doubt that that’s what the designers/decorators had in mind when they included the cases as part of the shop’s decor. 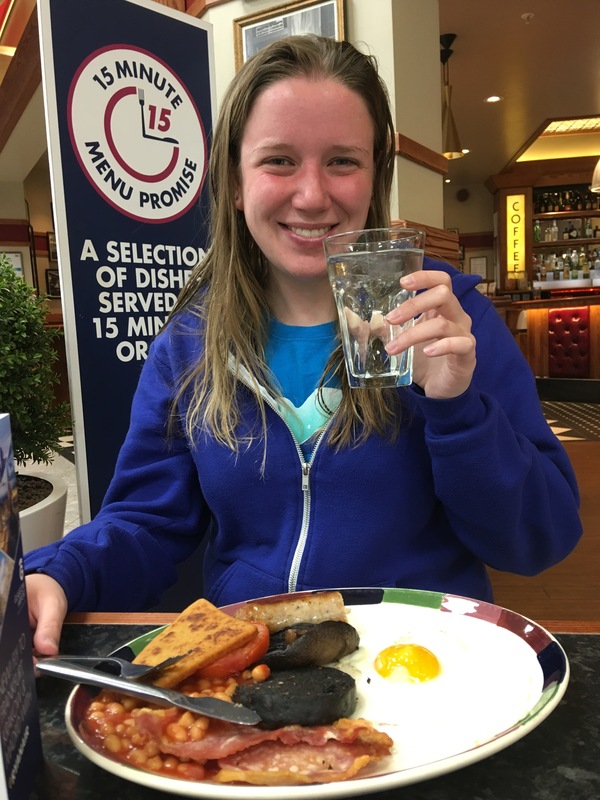 We spent the majority of our layover time enjoying a leisurely breakfast. 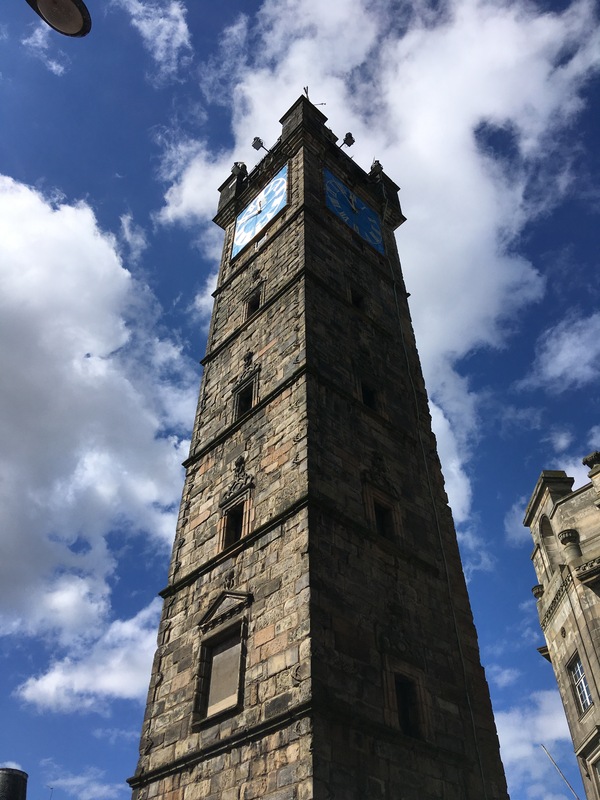 The time passed quite quickly, and then we flew from London up to Glasgow, arriving in Glasgow around 8:00 p.m., a full day since we had left Calgary. 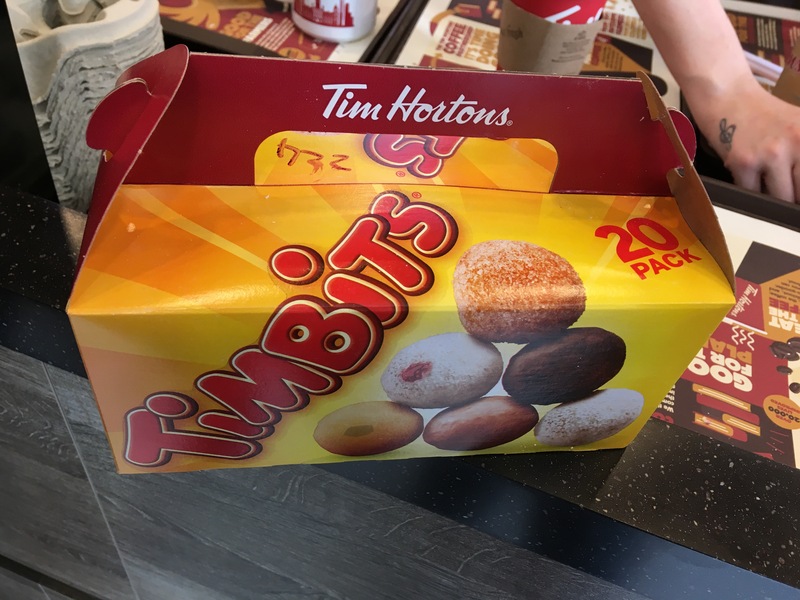 We spent our first night at the Holiday Inn Glasgow Airport, and were bright-faced and fresh when we returned to the airport terminal the next morning to greet our band-mates, arriving from Toronto. 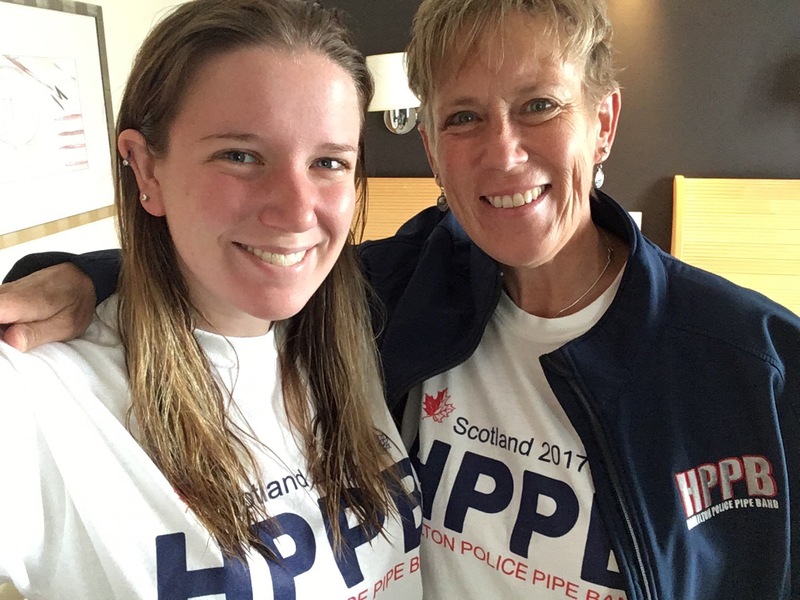 Their flight was a little bit delayed, so we found ourselves once again enjoying breakfast in a pub at an airport, but this time we were fully decked out in our “Hamilton Police Pipe Band” garb. 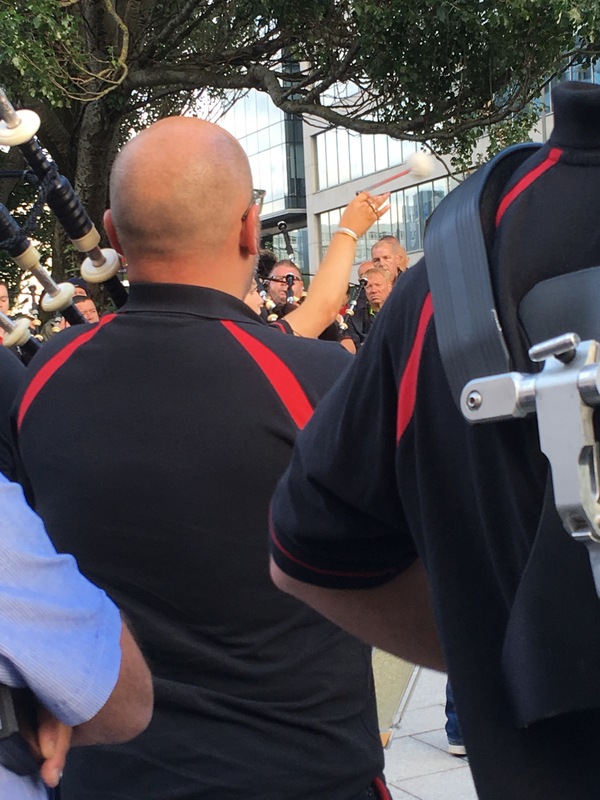 The band arrived – actually, two bands, because the Hamilton Police Pipe Band has a band which competed in Grade 3A at the Worlds, and also a band that competed in Grade 4B at the Worlds. All told, I believe there were 88 members of our group. Certainly a great organization, and great fun to be part of! 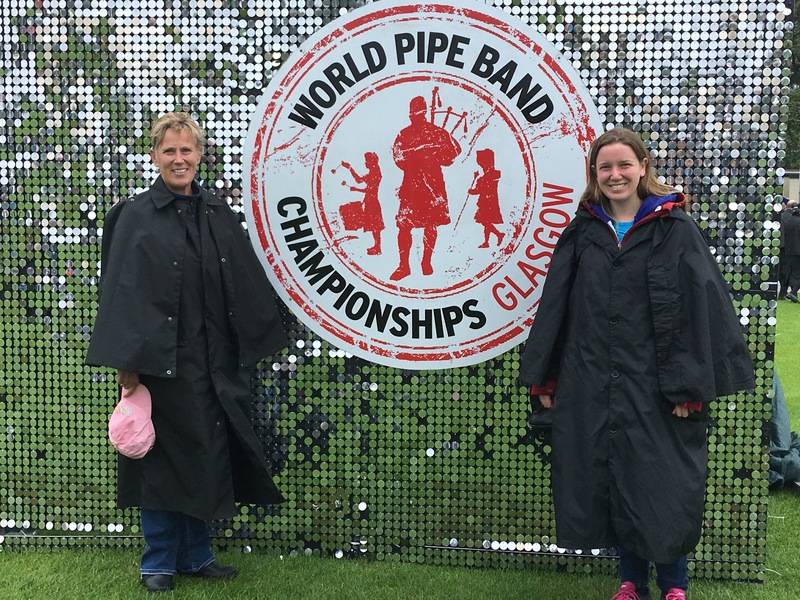 We were bussed to our dorms at Caledonian Courts, almost right in the heart of Glasgow, and certainly well within walking distance of everything piping-related that would be happening during Worlds week. 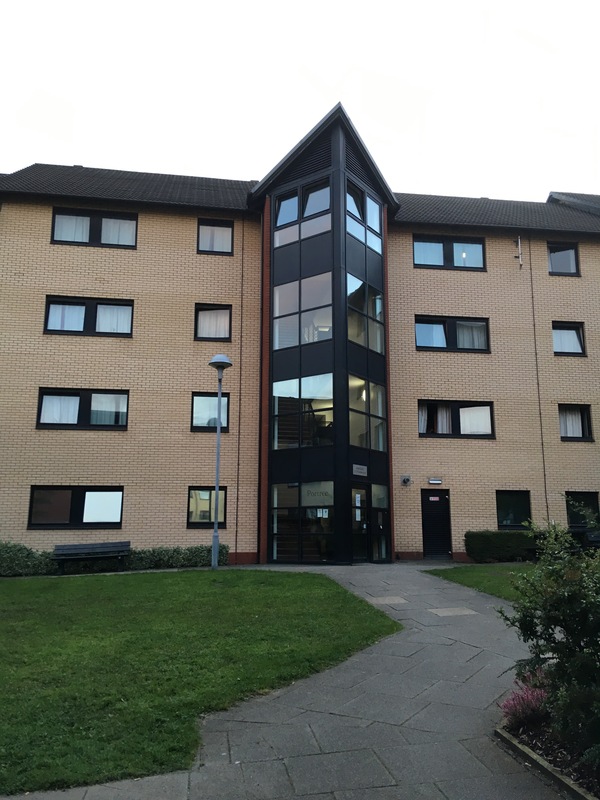 I was excited to see the names of the two dorms which housed our band – “Orkney” and “Portree”. 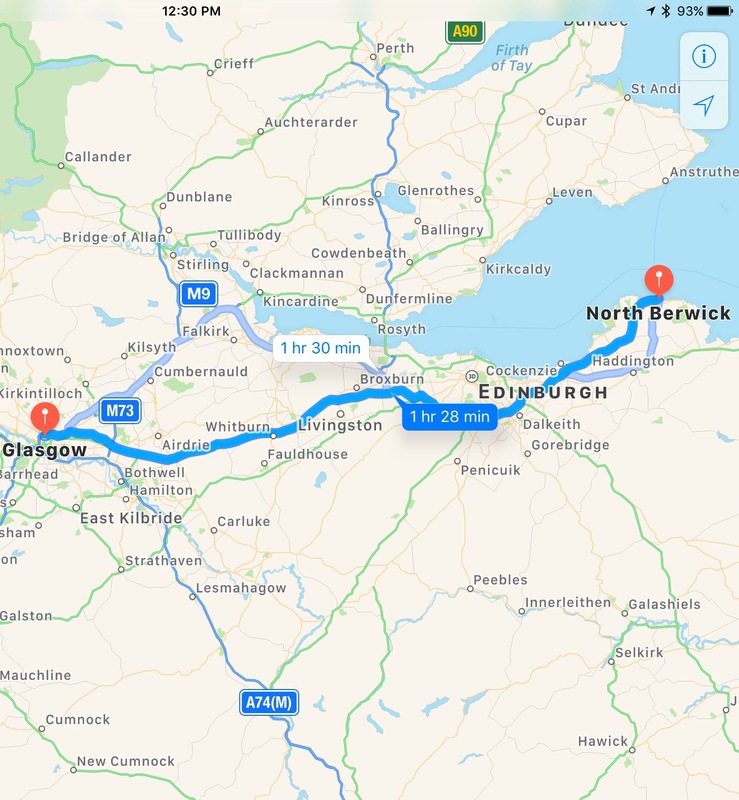 How fun is that, given I’ve spent quite a bit of time in both Orkney and Portree?! 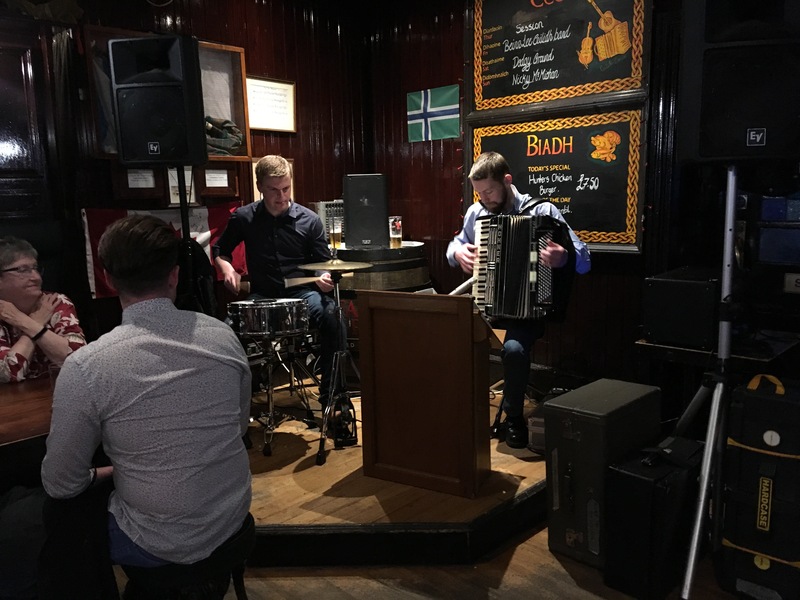 We had a short band session late afternoon, and then we were left to our own devices for the rest of the day… quite predictably, a group of us eventually found our way to the Station Bar, just a five-minute walk away. You can see in the photos below that Robyn was having a bit of a tough time fitting in with her new band friends. 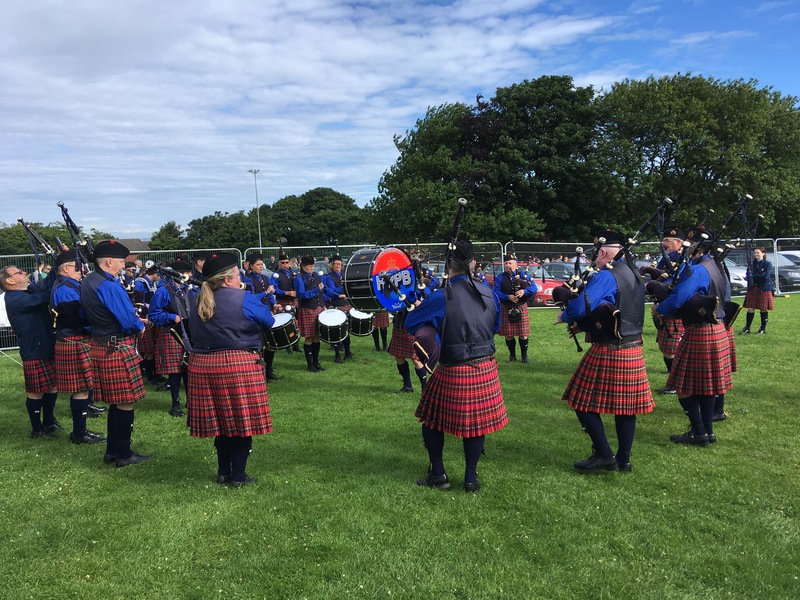 On Friday August 4th, both bands spent some time practising, as our first outing was to be Saturday, August 5, at a competition in North Berwick. North Berwick is a lovely seaside town on the east coast of Scotland, just slightly north and east of Edinburgh. The bus trip took about an hour and a half each way. 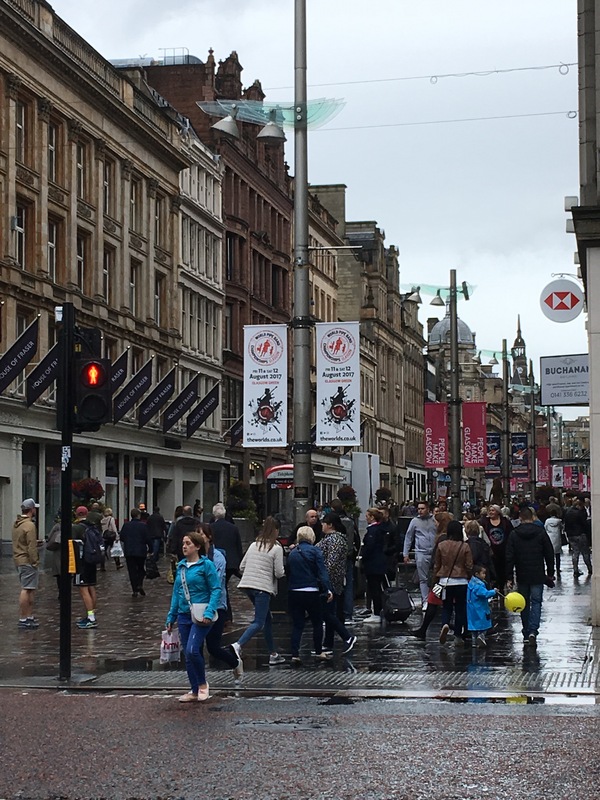 The weather that day was typically Scottish – in turns, it was cool, then hot and sunny, then rainy and windy, then cool, then back to hot and sunny. And here we are in our matching HPPB outfits! 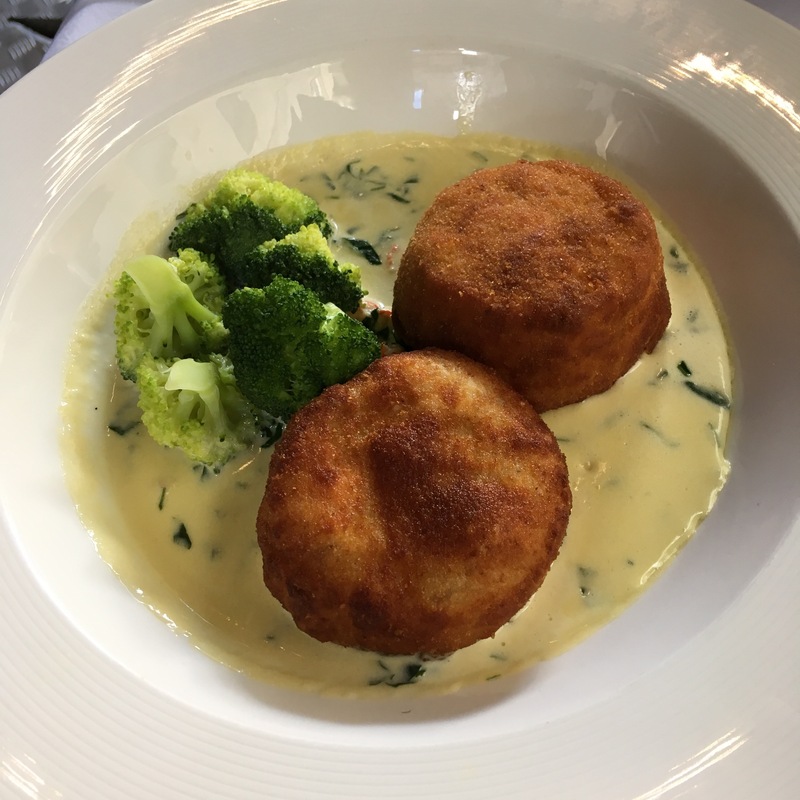 We had been entered to play the next day as well, at a competition at Bridge of Allan, but we decided not to go, given that the weather forecast was looking quite dismal. By all accounts, we made the right decision. Throughout Worlds week, we balanced our time between band practices, touristing, and socializing. Highlights included a bit of a shopping trip and also a tour of Glasgow on the “Hop-On/Hop-Off” double decker bus, some fun times at the Park Bar, hanging out at the National Piping Centre, listening to Field Marshall Montgomery Pipe Band and Police Service of Northern Ireland band practices, meeting up with friends Pete, Mick, Davey, Craig, Andy, and Lorne, and indulging in some of Glasgow’s hidden gem restaurants. 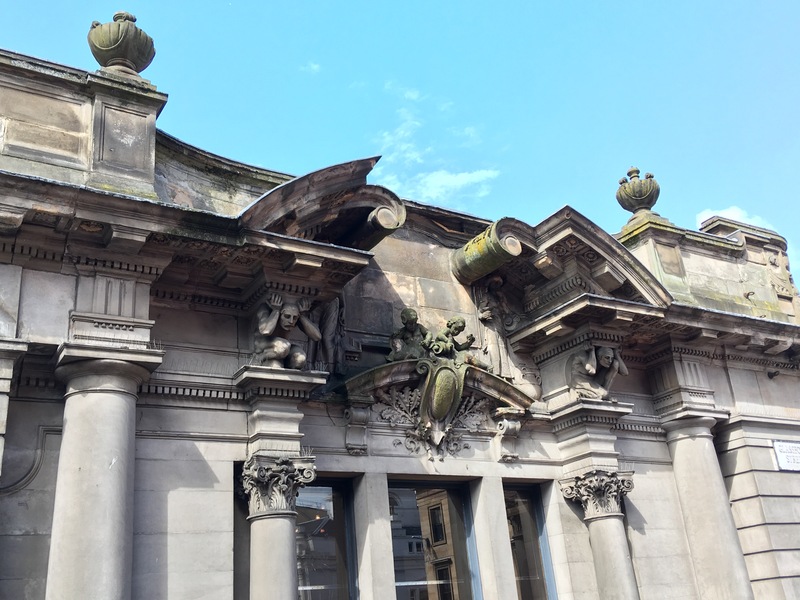 There’s a Tim Horton’s in Glasgow! 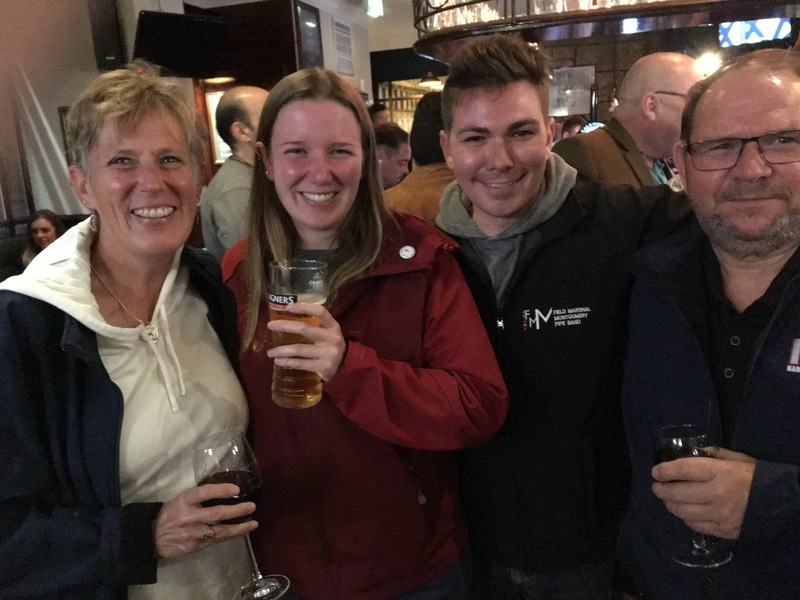 Some family fun was had – Ann Gray and her daughter Robyn, and John Elliott and his son Andrew (who plays with Field Marshal Montgomery). 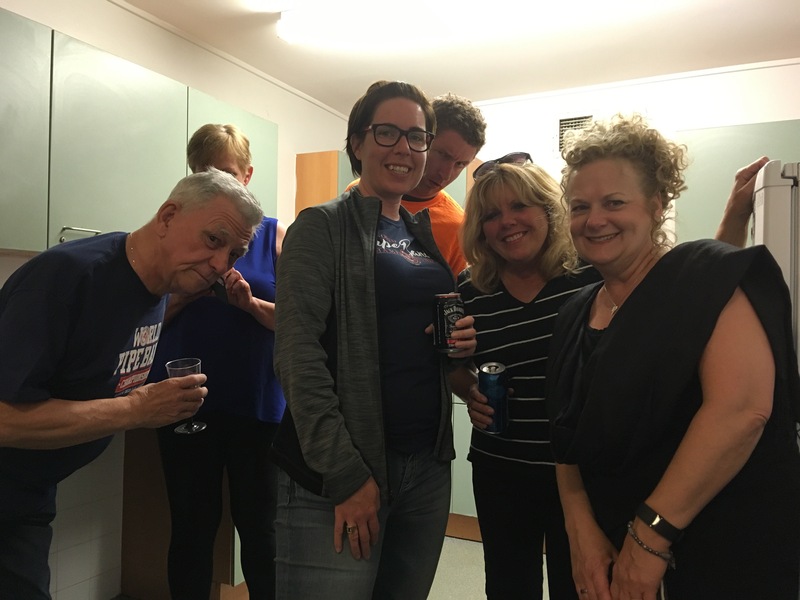 Or – is that Robyn Gray and her mother, and Andrew Elliott and his father? 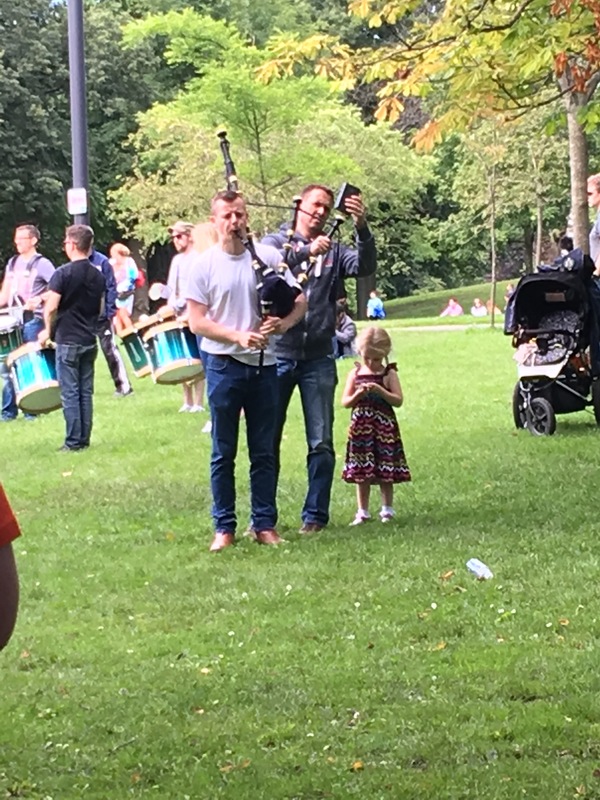 Watching this little girl (photo below) cracked me up – she must be the drone tuner’s daughter, as she followed him all around the circle, standing patiently every time he stopped to touch up someone’s drones. 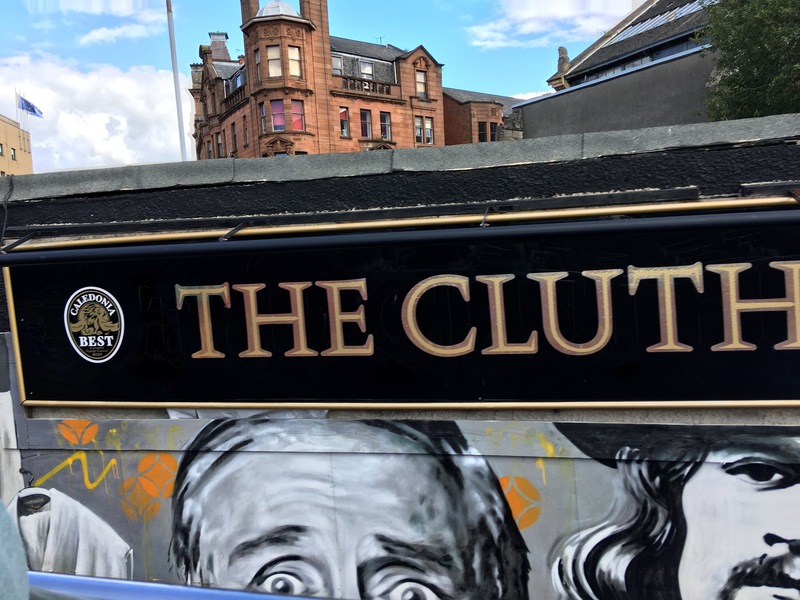 The Clutha, a very popular live music venue in Glasgow, (as opposed to “The Cluth”, as my snap would imply – oops!) sadly made the news four years back, as a freak accident led to a police helicopter crashing through the roof of the bar while it was filled with patrons enjoying their evening. A very short version of the story can be found Here. 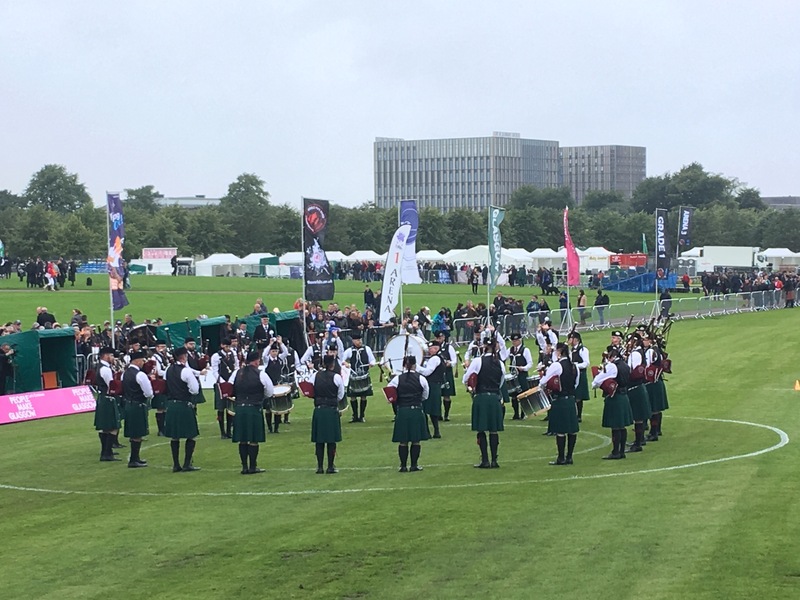 On Friday, August 11th, the qualifying competition for the grade 1 bands took place. 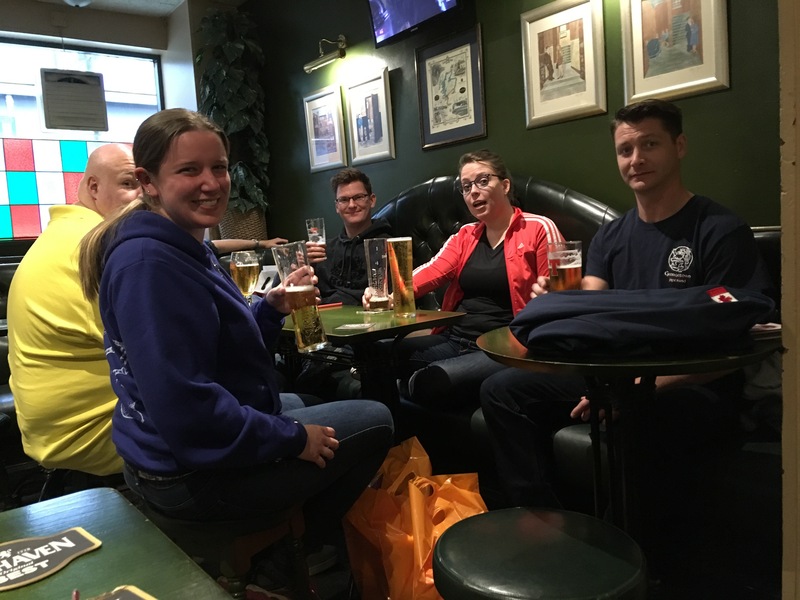 The majority of our group went to watch – and with good reason! 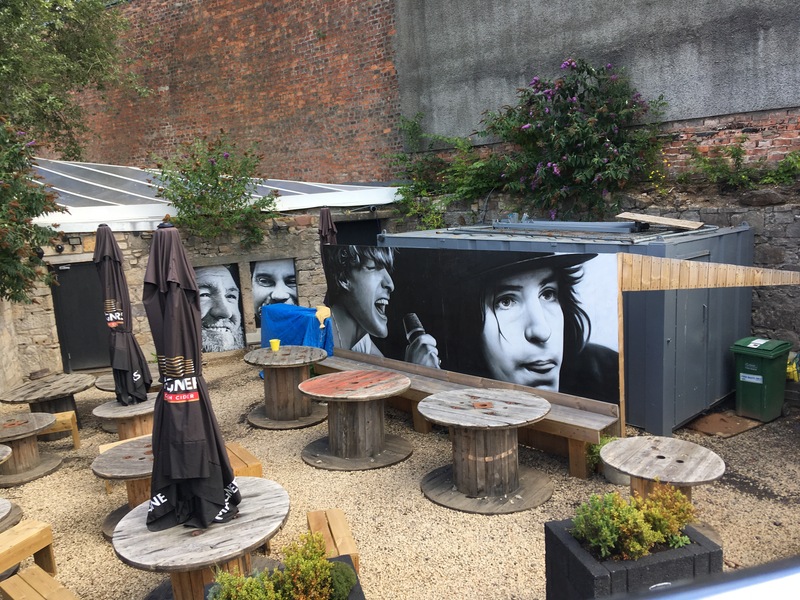 Twenty of the best bands in the world were competing, in two heats of ten each, vying for the coveted twelve spots (six from each heat) in the Grade 1 final competition, which was to be held the next day. On the Friday, the grandstand seats were open, free to anyone who wanted them, and crowds were sparse enough that we could get quite up close and personal with all of the bands, not only as they were warming up, but also as they were competing. 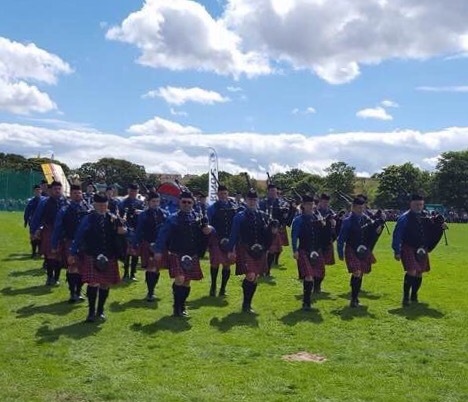 This was a particular treat for me, since for the past four years I was part of a band that competed in the grade 1 qualifier (LA Scots Pipe Band), and while that was incredibly exciting to be part of, it meant that the opportunity to listen to and see the other grade 1 bands didn’t exist. And below is the Pipes & Drums of the Police Service of Northern Ireland (PSNI). They are in their first year at the grade 1 level, after being promoted from Grade 2 at the end of last year. They made it through the qualifier and into the final, which was very exciting, and no easy feat! 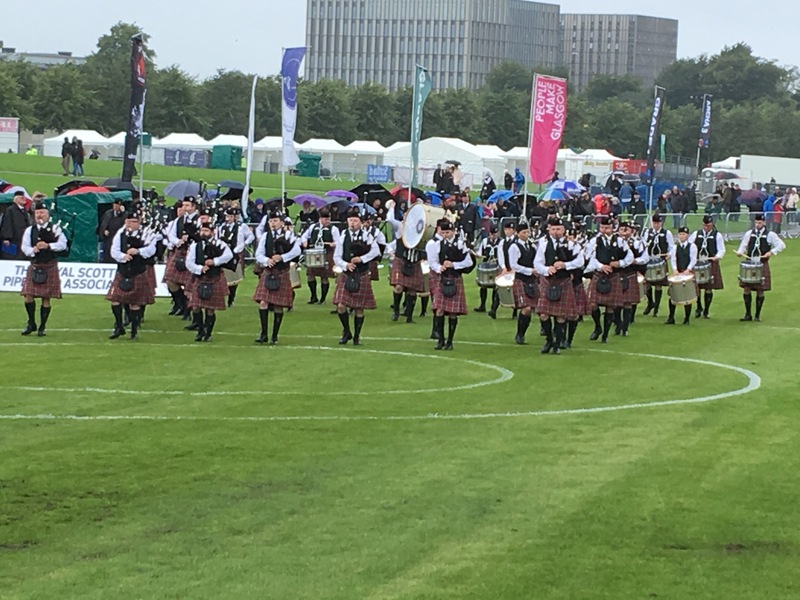 I didn’t get many photos on the day, as it was just a bit too busy, what with playing in the World Pipe Band Championships and all. I can tell you that we did have a good run, although Mother Nature wasn’t on our side – just as we were headed to the final tuning area, we were hit with a downpour so intense that we actually had to run for cover, which cut into our preparation time, and as a result everyone was a bit disconcerted, and our tuning issues didn’t quite get resolved before we went on. We unfortunately didn’t make it through our qualifying round and into the final, but at the end of the day overall we were only 1 point away from having made it into the top six, which would have put us in the final. 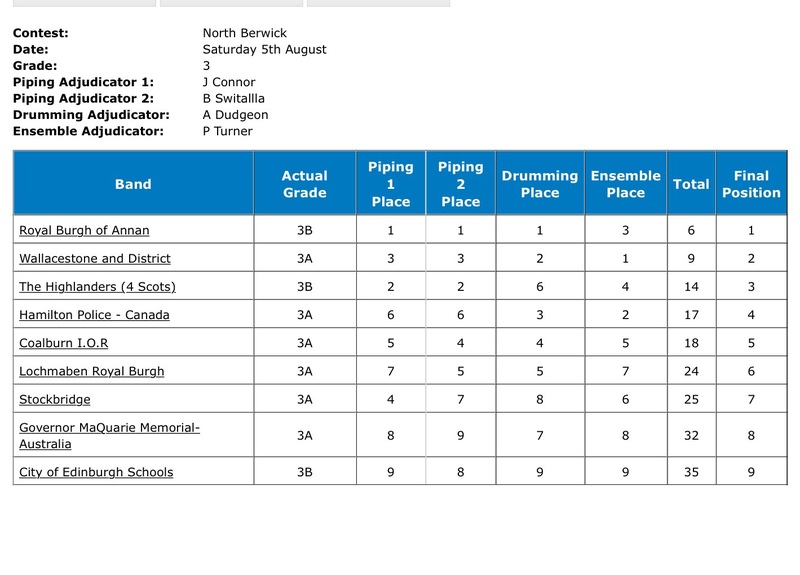 Our drummers had a great result, placing 4th in drumming in the qualifier, which was very impressive! 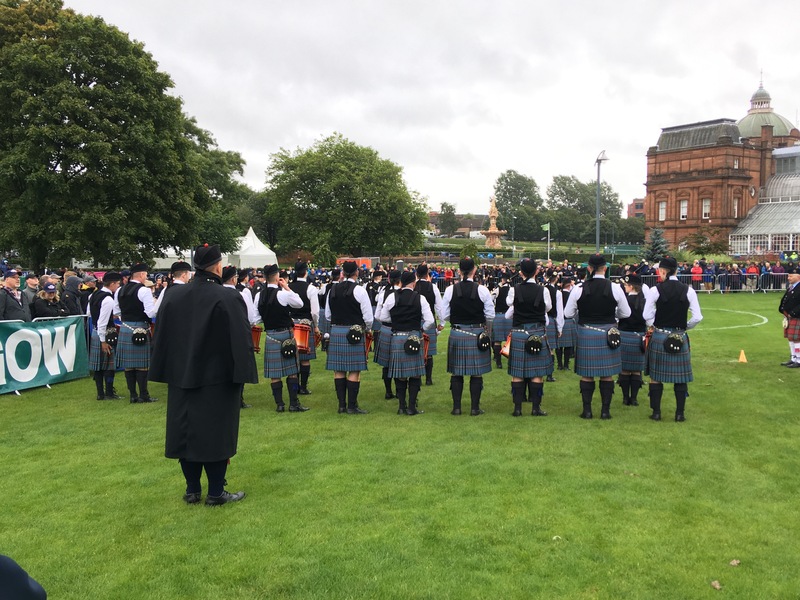 Congratulations to all of the bands who got good results at the 2017 World Pipe Band Championships! 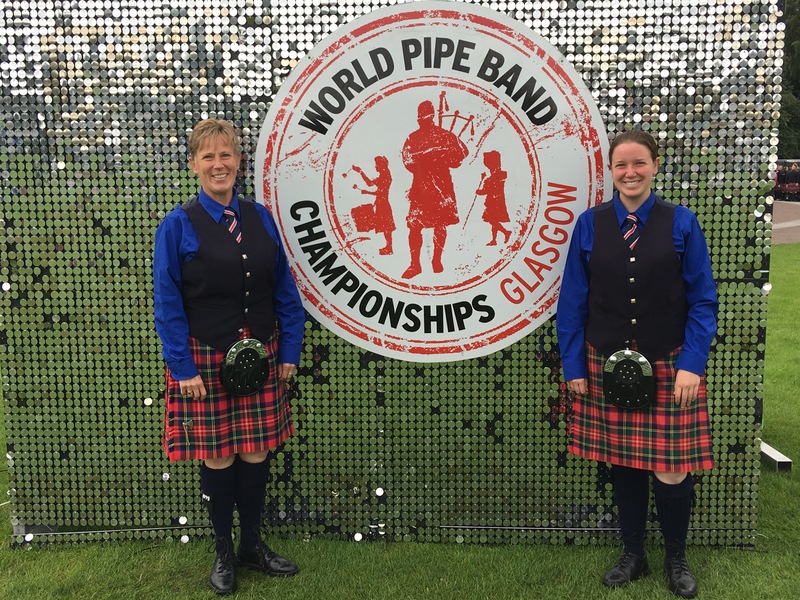 Inverary & District Pipe Band won the Grade 1, and the title of “World Champions” – first time for them, after being bridesmaids for quite a few years. The 2016 champions, Field Marshal Montgomery from Northern Ireland, were second in grade 1, and St. Laurence O’Toole from Dublin were third. It’s quite a rush playing at such a huge competition. 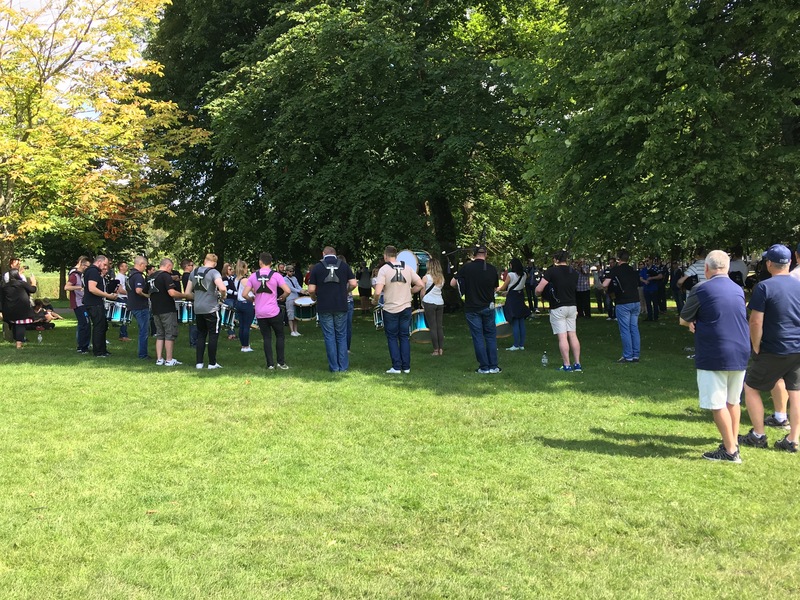 The time and effort that goes into preparing a band to compete at the Worlds is massive. Months, even years of planning and preparation, fundraising, organization – and of course learning and trying to perfect the music. Because what it all boils down to is the fact that we are the makers of music. While ours is a music that seems to focus on precision – precision of technique, of timing, and of tuning – to an extent that some might find inordinately extreme, it’s all still about music. We as pipe band members strive to play our music on the nine notes that are available to us the very best that we can. 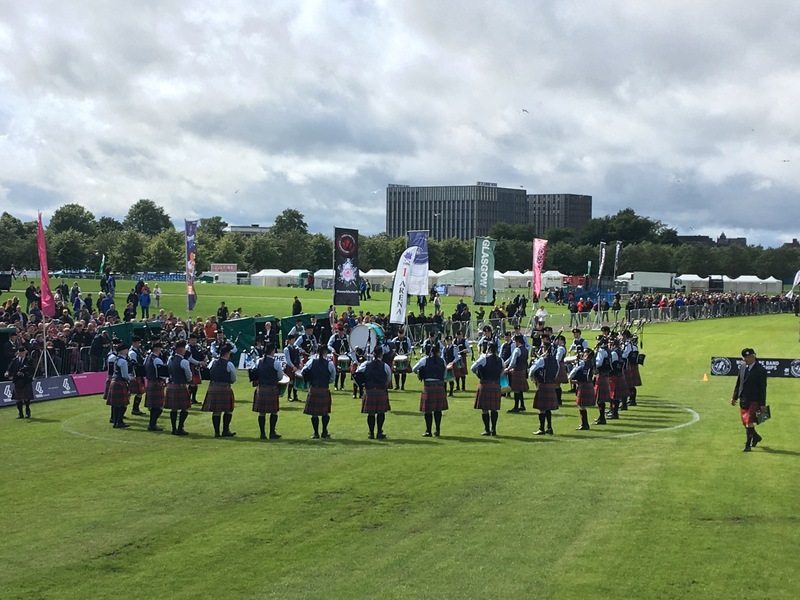 And because ours is a type of music for which competition is still the most available venue, we all dream to be “World Champions” when we make the plans to travel to Glasgow and compete at Glasgow Green for that title. We are the music makers; and we are the dreamers of dreams. 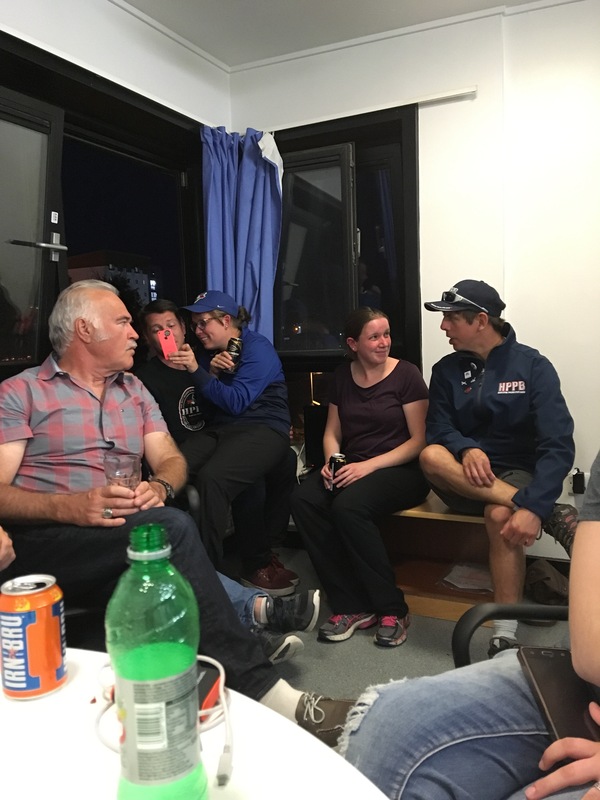 In the evening after the competition on August 12th at Glasgow Green, after all the results had been announced and after everyone had changed from tartan garb and into more comfortable and relaxing clothes, and some wine and snacks had made their way to the table, a completely spontaneous session broke out in the kitchen of one of the flats in our “Portree” dorm. 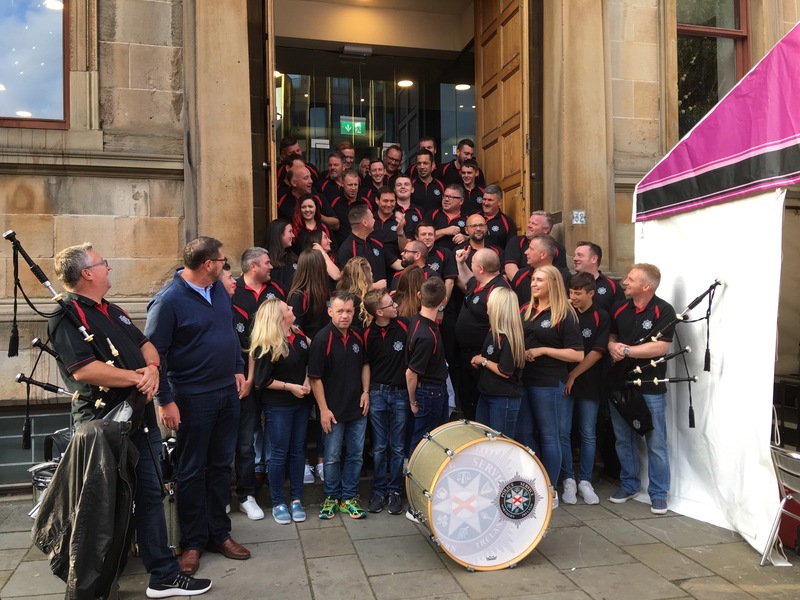 It had nothing to do with bagpipes, and everything to do with a group of people who had truly enjoyed their time together working as a band to compete on a world-class level. It started as a few people listening to some music, and gradually more people joined the party, and the music got louder, and more people started singing along, until it was past midnight and I had to start thinking about leaving the party as Robyn and I had to be at the airport by 6:00 the following morning. 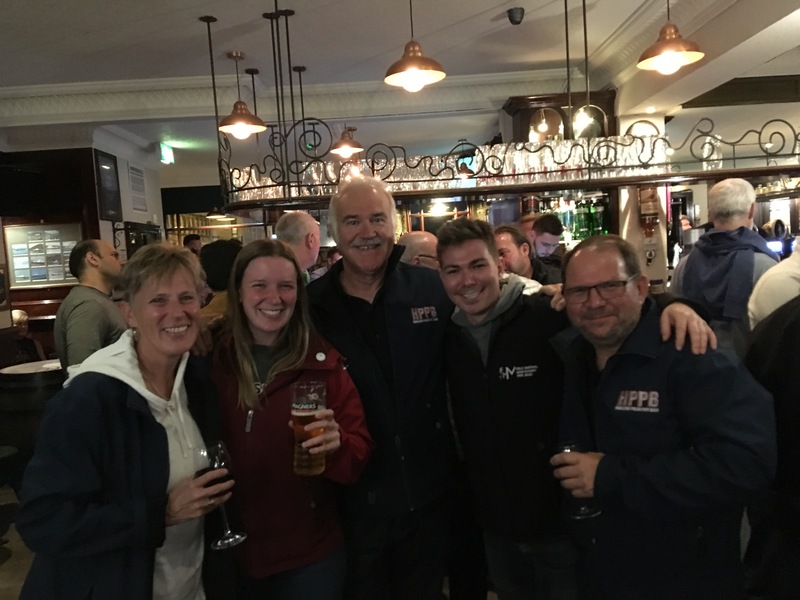 It was probably the most fun in a full day that I’ve had in years – the most laughter, music, merriment and mirth – and I’m looking forward to continuing to be a part of the Hamilton Police Pipe Band. Unfortunately, morning came early. 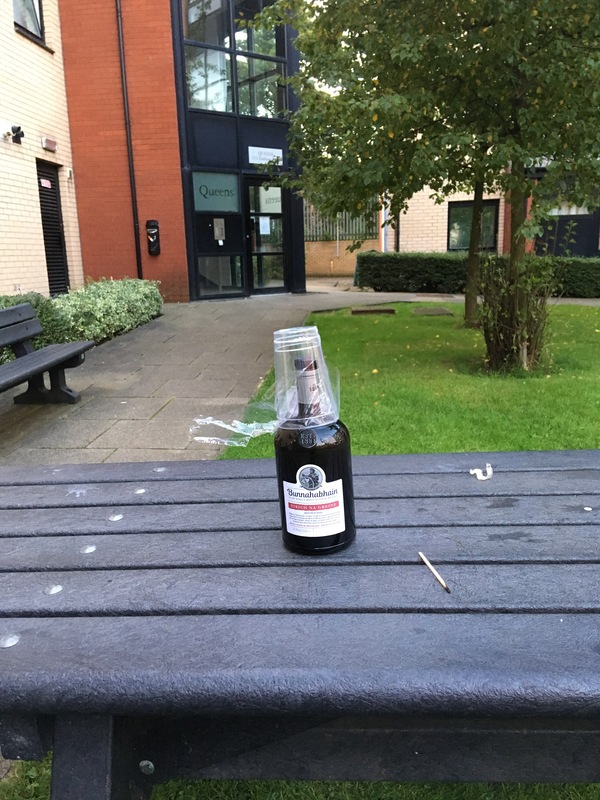 As we were leaving our Portree dorm, we spotted a lone empty single malt whisky bottle on a picnic table – no doubt with tales of its own to tell – and the entire place was eerily quiet. Given that these dorms house numerous pipe bands every year during Worlds week, I’m sure that the quiet is just a calm before the storm, even if the next storm doesn’t hit until Worlds week 2018! 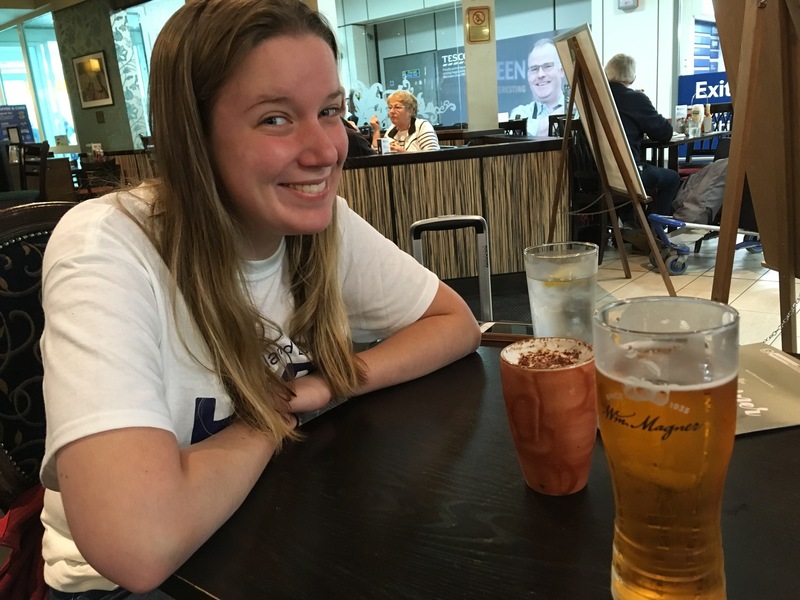 We made it to the airport in plenty of time, and we were both delighted when a good friend of Robyn’s, who had been on holiday in Shetland and was on her way back home to Halifax, was able to meet up with us at the airport for a visit. … and we flew back to Calgary, via Toronto. 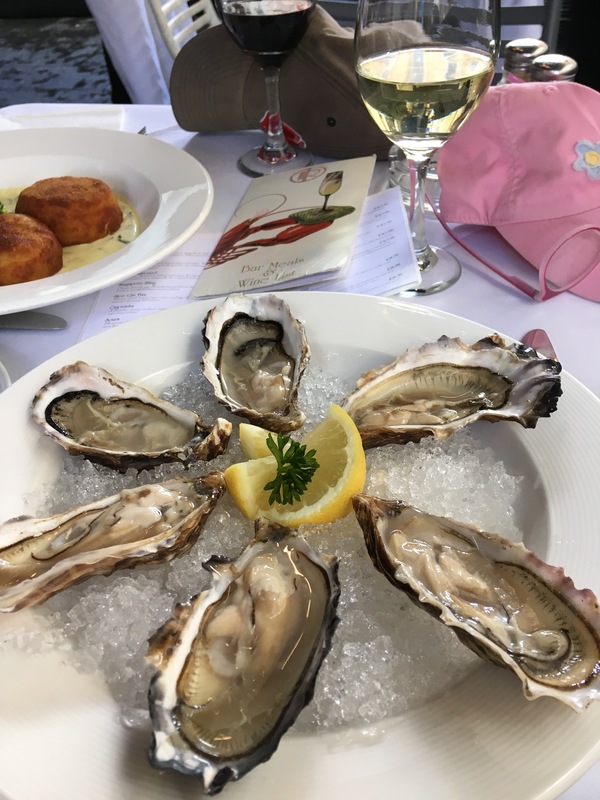 A fabulous trip indeed. Good friends, good music, good fun. And that’s pretty much it. We are the music makers, and we are the dreamers of dreams. 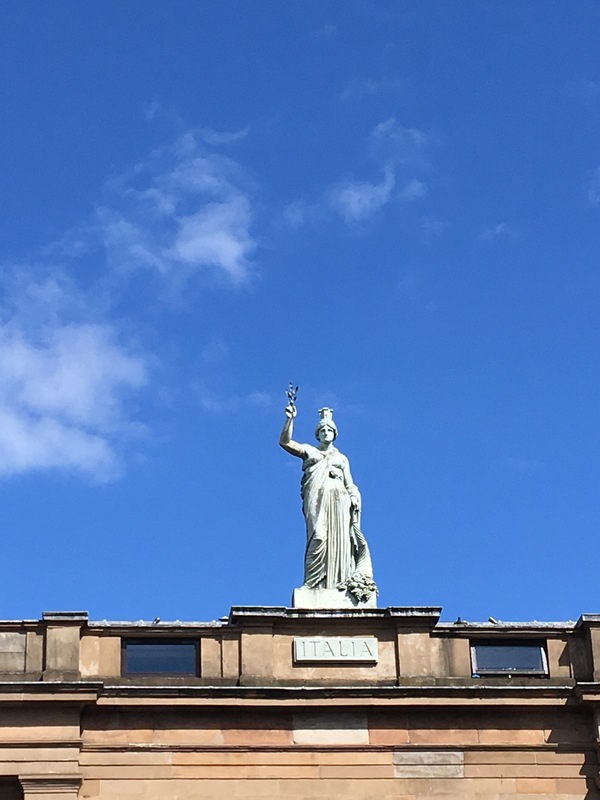 Thig Crioch air an t-saoghal, ach mairidh gaol is ceol. The end of the world will come, but love and music will live forever. Thanks for reading! More tales to follow – until then, have good days, and stay tuned. That was a great post Ann. Almost as good as being there. Looking forward to part 1. I was disappointed that I wasn’t able to make the trip due to some last minute unforeseen circumstances. I was particularly existed about the prospect of playing at the worlds with my son as I’m sure you were excited to play there with Robyn. But we’ll do it next time. The people in this group are really second to none and I was glad to see you are staying on board. I’m sure there will be more great music to play and enjoy and more memorable moments of good fellowship and fun in the future.